Author event at Racine Barnes & Noble Saturday, February 16 I’ll be reading from God Johnson and giving free signed color copies of the cover with every purchase of the e-book 3:30-4. I’m also on the panel for the writers workshop from 1230 to 2 PM, please come say hey if you can! Chatting about Weird Wisconsin and Real Wolfmen too! Bigfoot in the British Isles? The idea of huge, hairy man-apes hiding out in the manor-dotted, bucolic countryside of the British Isles seems as likely at first blush as the queen switching out her Earl Grey for chugs of Red Bull. 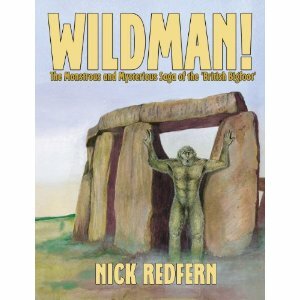 But Nick Redfern’s new book, Wild Man! The Monstrous and Mysterious Saga of the British Bigfoot, (CFZ Press, 2012) makes an exhaustive and surprisingly compelling case that people have indeed been seeing anomalous, Bigfoot-like creatures from Shugborough to Derbyshire, perhaps for centuries! Redfern has to be one of the most prolific current writers on strange and cryptozoological topics — he releases books faster than I can find time to review them. But I wanted to make sure that I got this one posted because it covers so many topics of interest to the worldwide cadre of Bigfoot-seekers. It has the additional advantage of being authored by a native of the British soil who possesses many area connections and much firsthand knowledge. Redfern starts by grounding the wild man topic in medieval history, harking back to the wodewose, or hairy, naked men seen throughout the forests of England since at least the early 14th century. But he notes that the wodewose was described as very close to human underneath all that fur. The nearly 300, large pages are packed with anecdotes in a timeframe that ranges from ancient to contemporary, but the book is about more than mysterious case studies. Redfern doesn’t shy away from possible explanations for the anomalous creatures, venturing into possibilities such as misidentifications with primates released from the private zoos of eccentric collectors. He also notes the difficulty of explaining how large predators could subsist in the English countryside without detection and lays out a theory that they may be “semi-physical” or products of some other process that is not presently known to science. Whatever these wild things are, Redfern’s examination of them belongs on the bookshelf of anyone interested in anomalous creatures, especially those of the hairy hominoid kind. There may be more beasties hiding in that famed British mist than anyone has previously guessed.